You can never find me munching on fresh blueberries but I’ll add it more than often to my baking. 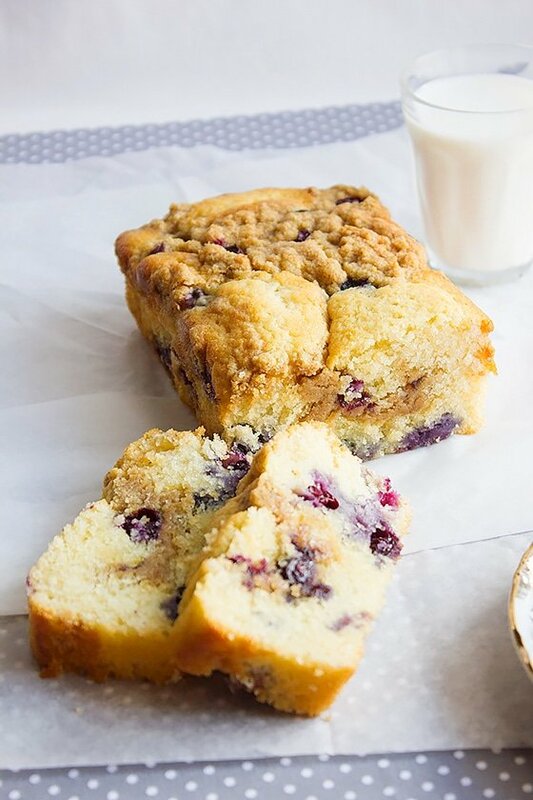 This Blueberry Butter Loaf Cake is another attempt of mine to consume blueberries in a sophisticated and fun way. Blueberries when baked change in taste and texture, and boy that change is awesome. 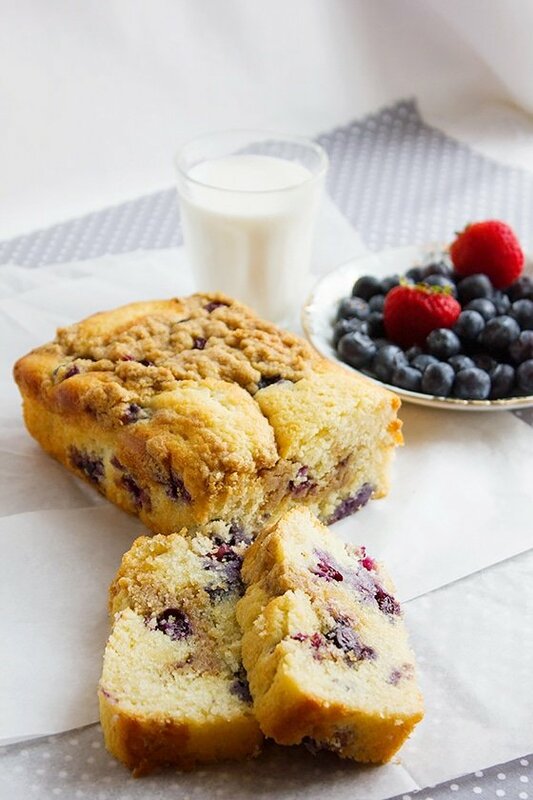 I hope you can see from the pictures how moist and delicate this Blueberry Butter Loaf Cake is. I can go on and on, on how delicious and addictive it is but I want you to be the judge and experience its mind blowing flavor. Making this beauty hardly takes time, no need for electric gadget, all you need is a hand whisk and two bowls. In fact, you can make this cake in one bowl. 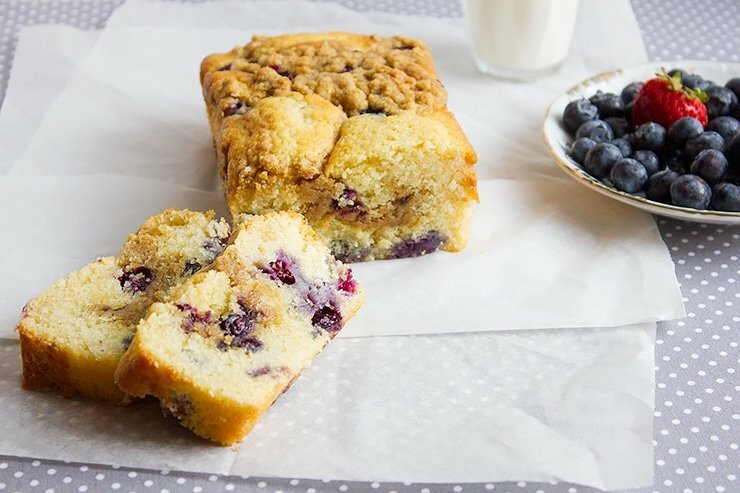 I’m falling in love with loaf cakes these days, Orange Sour Cream Loaf Cake, Banana Zebra Bread cake, Chocolate Fudge Loaf Cake, and now my all-time favorite Blueberry Butter Loaf cake. I think loaf cakes look amazing and need no decorating, simply beautiful. 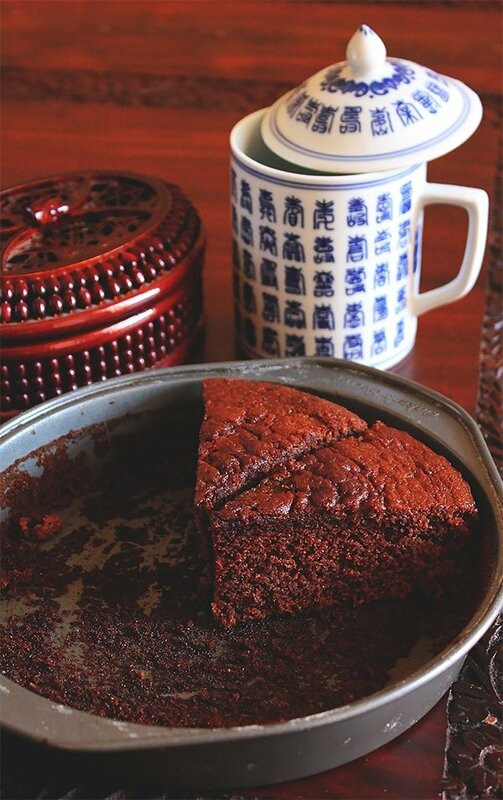 The cake is rich but so moist that even after 3 days if kept at moderate room temperature it will hold on to its flavor and moist texture. All butter based cakes should not be refrigerated, the butter will harden which will result in a dry cake. 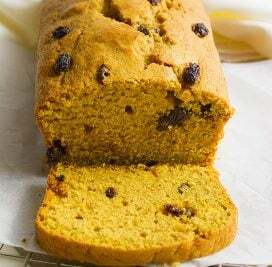 I have used fresh blueberries in this recipe, but you can use any type of berries and if you don’t mind a stained cake, then use frozen berries. Preheat oven to 350F/180C. Line a baking pan 9 x 5 x 3 inch with parchment paper. In a bowl, sift flour with baking powder and salt. Keep aside. In a different bowl, beat the sugar and egg until lighter in color, add vanilla, butter, milk, and beat until well combined. Add the dry ingredients to the wet and gently mix. Add the blueberry and fold gently to avoid the blueberry from bleeding in the batter. Pour the batter into the previously prepared baking pan. 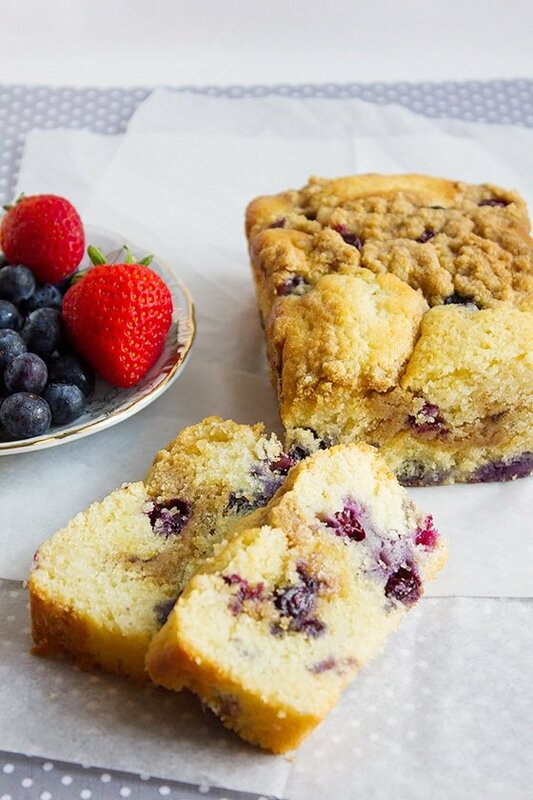 Spread the streusel evenly over the batter, add few blueberries on top and bake for 50 minutes, or until a toothpick inserted in the middle of the cake comes out clean. In a bowl, mix all ingredients together using a fork to form breadcrumb like texture. 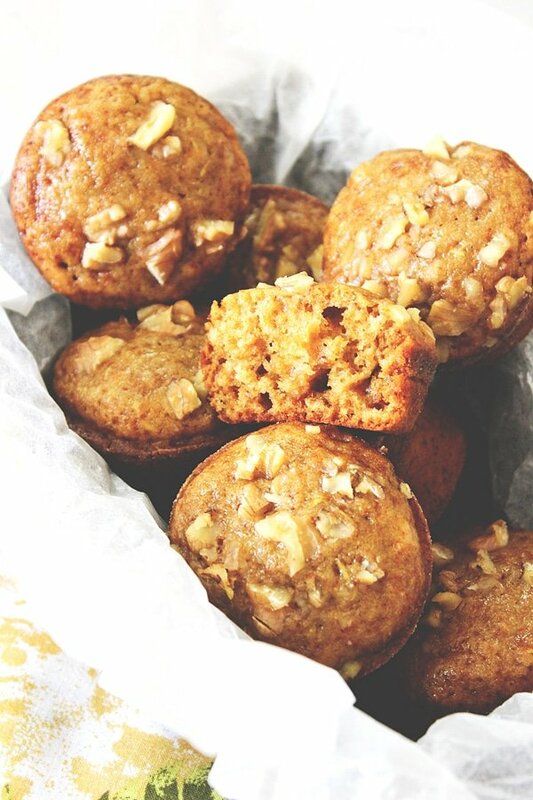 This would be great for breakfast or afternoon tea snack…beautiful and tasty! I actually just pulled a blueberry cake out of the oven but I don’t think one can ever have enough blueberry cake recipes. This one sounds wonderful and I love how simple it is to put together! 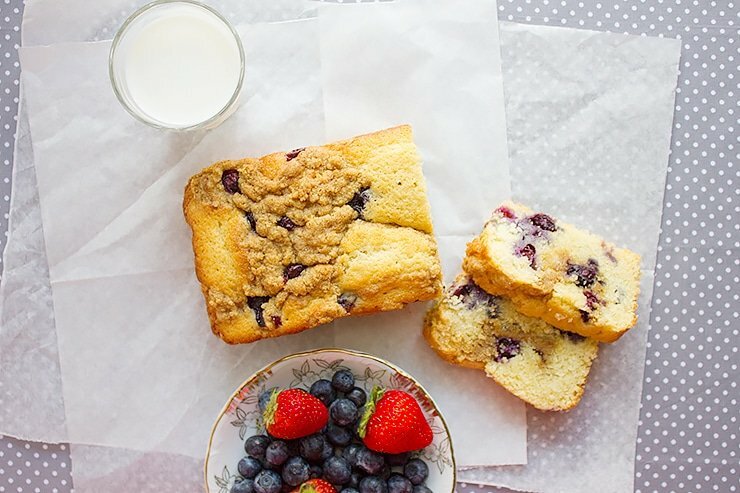 It’s okay to fall in love with loaf cakes.I think I do too!I am loving this blueberry butter loaf cake! Delicious! is the streusel a must? I mean couldn’t we spare these extra calories?